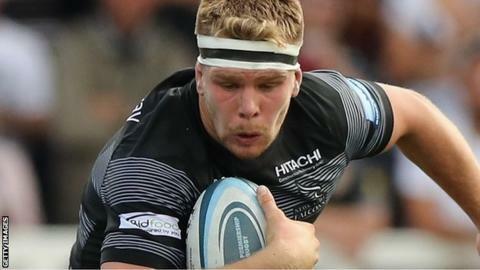 Newcastle Falcons back row Callum Chick and fly-half Brett Connon have signed new contracts with the Premiership's bottom-placed club. Connon has agreed a two-year extension, while fellow 22-year-old Chick has signed an undisclosed-length deal. Chick scored the winning try in a dramatic European Champions Cup victory against Montpellier in October. "I was a Falcons fan growing up, this has always been my club and it's great to extend my contract here," he said. Director of rugby Dean Richards said: "Callum is a very talented player who has already proven himself capable at the very top level of the club game.